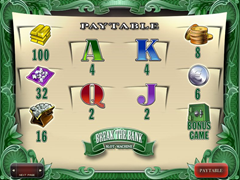 Break The Bank Pokie Review - Play today! If you have had thought of just walking into the safe at the bank and pack a bag of cash, this is your change and you don’t have to break the bank as you will earn every sent on the reels while having some of the best fun. 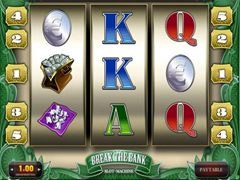 This game offers to give you huge wins on 3 reels with 27 paylines with a bonus game. This pokie offer great riches from the progressive jackpot and a second highest payout of 5,000 coins. A very affordable bet of max 1.00 make sure everybody can afford to enjoy the wonderful entertainment this game offers and have the chance to trigger the ever increasing progressive jackpot. Great detail makes this a visually attractive with the screen designed to resemble the looks of a green bank note and the three reels are polished gold. Payline numbers are indicated on mini notes of gold on both sides of the reels. The symbols are leather hand luggage filled with neatly piled cash, purple velvet cloth holding a large variety of high valued diamonds, silver coins, green safe with silver safety clips and number dial, pile of golden slabs and a selection of golden coins. The pokie has a symbol, which is presented by the vault door of the bank. This is a jackpot and a wild symbol, which means it will be able to complete winnings when you get less than 3 of them on the reels with the other symbol, it will be able to replace any of the symbols, and when you manage to get all 3 of them on one of the lines you will in one of 5 jackpots ranging from 1,000 coins all the way up to 2,400 coins. Those wishing to gain the opportunity to have such a large amount of money in your bank account that you’ve broken the limit allowed in your account then you shall enjoy this slot as it offers you that opportunity. This rich pokie is a pleasure to play with every combination wonderfully detailed with great looking symbols. Once you give this uncomplicated pokie a try it will be hard to stay away from it with the wonderful smooth action of the reels, and the generous wins.